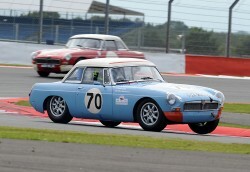 The MG Car Club organised race, for which entry was by invitation only, was open to pre 1966 FIA specification MGB racers, and we were privileged to be invited to take part. We have thoroughly prepared and tested the car, and Oliver and Callum have previously finished strongly in the Autosport 3 hour race at Snetterton earlier in June. Every effort was made to ready ourselves for this event at our home track and it was decided that Callum would drive solo in the MGB 50 race and Oliver would do the same on Sunday in the Ecurie GTS event. Despite wet weather spoiling our test day on the Friday, Callum drove the wheels off the car to secure a convincing pole position, and then judged the rolling start to perfection to stretch into an early lead. The mandatory pit stop went smoothly and Callum did not put a foot wrong on his way to a convincing victory. Pole position and fastest lap were the icing on the cake on what was a fantastic weekend. Mike O'Brien said: "This was probably the biggest MG race ever and we wanted to showcase the car which we were looking after, Things couldnt have gone any better with our car being consistently fast and extremly reliable throughout the whole weekend, and this ranks as one of Speedsport's most memorable victories".